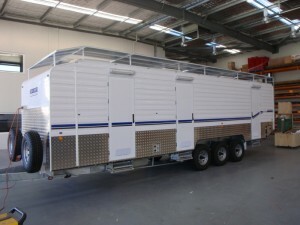 Tri Axle design, with more space per bedroom. Luxury accommodation for those remote jobs. 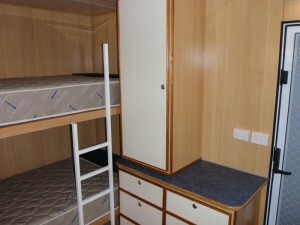 3 Bedroom, Sleeps 3 or 6 in bunks. 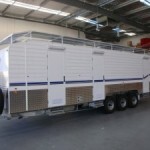 Our accommodation units are ideal for the outback. At only 8.2m, it can be easily towed by a Land Cruiser. 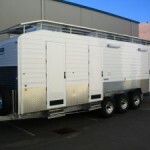 Our “Driller Proof” vans are built tough to handle the everyday rigours of an onsite environment. 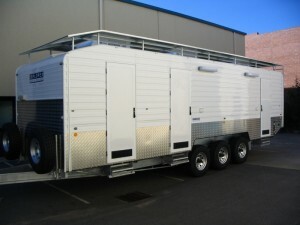 Built tough, they are easily capable of withstanding the rigours of travelling to and from some of the most remote of areas of Australia while providing a safe and comfortable facilities on site for your most valuable assets… your staff. The chassis are built to endure the toughest conditions. Side panels are extremely strong and offer unbelievable heat and sound insulation, making for a quiet and pleasant environment for the occupants. All of our units use the latest innovations in van construction to give our clients a product that will provide a trouble free service for years. 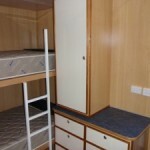 We have a full range of accommodation, kitchen and amenities units in three standard sizes and we are able to accommodate up to eight persons in a single unit with the use of bunk beds. Hiring accommodation offers a cost effective solution to your mobile accommodation needs and will provide a cool, comfortable and safe environment for your team to relax in.